Activate this feature for your Site Collection. Works wonderfully well, but refreshes the whole page when you click on respective Tabs, our task is to make it AJAX driven, thereby causing only partial post-backs and not full page refreshes. 3. Ensure that you have MOSS SP 1 installed for sure; also install the December Cumulative updates from Microsoft too. 4. Configure your SharePoint web application with AJAX. It automatically adds the web.config extensions for you. Here are the installation steps:Download the zip file, extract it, and execute deploy.cmd on your MOSS environment. The stsadm commands for ajaxifying MOSS will then be available. stsadm -o addajax -url "http://your.moss.webapplication"
stsadm -o removeajax35 -url "http://your.moss.webapplication"
In any case, you are not successful and get stuck, using the above utility, refer to Mike’s blog at: http://sharepoint.microsoft.com/blogs/mike/Lists/Posts/Post.aspx?ID=3 and make the web.config changes manually. This is the final step in getting your Zone Tabs to work with AJAX, choose your Page Layout depending on your page, where you have added the Easy Tabs webpart, remember the webpart zone: for eg: Left, Middle, Right, Bottom, Top Left, Top Right etc. Similar to this you can add many Update Panels in different zones in the same page layout, I added two update panel controls with different id’s on the Left Webpart zone and the other on the Right webpart zone. 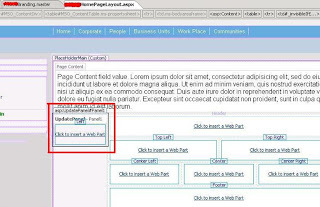 Finally go to your site page, see the Easy Tab webparts with AJAX in action. Now when you click any of the tabs, you will see only the webpart zone getting refreshed and not the full page. using this on WSS modifying the default.aspx, there is a problem. I have used this with MOSS 2007 with all the latest service packs installed. Follow the AJAX enabling instructions in my article. Then Place the UpdatePanel for any zone in your page, drag your dataview webpart in that AJAX enabled zone, and you will see partial page refresh in that zone. Well I gave it a try. Got the Ajax working ok. After adding the SPD pieces, it was breaking lists (NewForm, EditForm, etc.) I had to roll back. A shame, it's a request I got on Friday and was hoping it would fall in place. Thanks for the article, I'll give it a try again soon. I wonder why would this happen in the first place, just ensure you have WSS SP1, MOSS SP1, WSS Infrastructure updates and December cumulative update pack installed prior to AJAX enabling the site. The ajax was not a problem, WSS 3.0 SP1 December update. Tested ajax with one of Jan Tielens ajax web parts. I am using "Display settings (powered by Bewise)" http://www.codeplex.com/SPListDisplaySetting to aid in the visibility of the columns. I didn't edit any OOB forms but did create an additional new item form so I could have more control over how it acts. I am using a custom masterpage on the new item form and on the home page. I use the OOB master everywhere else. Updated the Article, ISSUE has been fixed. The brackets were images actually, I have now replaced them with text. 1. In the IE 6.0 when a tab is clicked it becomes completely white (with font and background in the same white color). This works fine in the IE 7. 2. Also when a tab is clicked the tiitle of the page gets changed to the "asp:Literal text ......."
Please let me know if there are fix or workarounds for these 2 issues. Will the install of the upcoming SP2 (http://blogs.technet.com/office_sustained_engineering/archive/2009/04/16/service-pack-2-for-the-2007-microsoft-office-system-due-to-ship-april-28th.aspx) be sufficient enough to get the AJAX tabs working. Or would we also need the december cumulative updates? This AJAX tabs code works well but there's a problem with using it for the display of list views. We have two tabs, each tab displays a different "Announcement" list view. The content shown by default is announcement title, date, author, and body text. On the initial load of the page, the body content shows for the first tab but when you click the second tab, you will not see the body content within that tab. Same issue when clicking back to the first tab. I think, SP2 will do the trick, they have grouped Dec and Feb cumulative updates together as SP2. I tried this configuration in my development environment (W2k3, MOSS 2k7 SP1) and everything works fine. The moss site is using the default template. Then I did exactly the same in a demo environment (Win 2k8, MOSS 2k7, Spanish language pack) in a customized spanish language site (using BlueBand template) and when I add the scriptmanager tag to the master page, I get an "Unexpected Error", and that's all the information I get. 05/21/2009 17:32:39.21 w3wp.exe (0x104C) 0x11E8 CMS Publishing 8tvo Unexpected Unable to retrieve TopNavigationBar SPNavigationNodeCollection from Web at: /Pages/Default.aspx. The SPNavigation store is likely corrupt. Failed to look up string with key "XomlUrl", keyfile core. Localized resource for token 'XomlUrl' could not be found for file with path: "C:\Program Files\Common Files\Microsoft Shared\Web Server Extensions\12\Template\Features\Fields\fieldswss.xml". Failed to look up string with key "RulesUrl", keyfile core. Localized resource for token 'RulesUrl' could not be found for file with path: "C:\Program Files\Common Files\Microsoft Shared\Web Server Extensions\12\Template\Features\Fields\fieldswss.xml". Failed to look up string with key "DistributionLists_Alias", keyfile core. Localized resource for token 'DistributionLists_Alias' could not be found for file with path: "C:\Program Files\Common Files\Microsoft Shared\Web Server Extensions\12\Template\xml\base.xml". I have subscribed to your post so I should get any reply you post. Thanks! Can you try onething, do not use the Blue Band master page on your Win 2k 8 MOSS 07 site. Instead try using a default master page, and then see whether you encounter this problem. If you do not encounter any problem with the default master page, then you may have to add some additional placeholders in your blue band master page. I would be very happy, if I read this blog before, I was trying to doing some ajax with WOSS like this but I tried to update the asp.net but not the way your check the web.config...so now I got all the website with customized masterpage say "system.web.ui.masterpage is missing from safe control" some like that...Would you mind if I ask for your suggestion to this? It seems to take 3-5 seconds to move between tabs. Is this normal or is there a way to speed up moving between the tabs? Can you please help me, i also received the same error message "The base type 'System.Web.UI.MasterPage' is not allowed for this page. The type is not registered as safe". URGENT:: First of all, thanks for making our lives easier by making the Ajax version. I downloaded the source code for zonetabs webpart and was trying to modify it. It seems that the author hasn't included all the files. It misses the file where he has declared tool part control --> pixeldropdownlist. Since you have modified the code, you must have fixed this one. Can you please upload the full source code or email it to me! THanks in advance! This walkthrough doesnt work anymore because unless you are using .net2.0 and ajax extensions 1.0. Newest versions are .net3.5 and ajax extensions 3.0... so you need a slightly different procedure. Urgent, Thanks a lot for this great blog. I followed the entire installation steps and everything looked good till the end. The Zone Tabs webpart is not functioning correctly. When I click on any tab, it switches fine for the first time only, however if I try and click on another tab, it does nothing. Note: I am using a custom master page. I'm also having the same problem as the one anonymous poster above. Clicking different tabs takes 5 seconds to refresh. I ran Fiddler on the page and the entire page contents is being sent on the response. How can only the Zone Tab data be transmitted on AJAX roundtrips? how to solve it, each zonetab need individual update. For those interested, I have taken the code and jQuery enabled it instead of using an AJAX postback. Seems to work pretty well and very fast! There is also some code in there to handle problems with a jCarousel control we're using, so you can strip that out if it isn't applicable in your situation. I am getting error "The base type 'System.Web.UI.MasterPage' is not allowed for this page. The type is not registered as safe". I don't know why "stsadm -o addajax" and "stsadm -o addajax35" remove it! I went back to add the line..perfect! It's works for me!! DO you have instructions for SharePoint 2010? It is by nature AJAX configured.